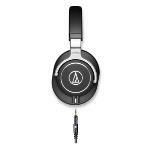 Audio Technica ATH-M70X Expert Reviews - Read Reviews and Buy Smarter Online. Verdict: Audio Technica is known to produce some of the best sounding monitor range. They totally dominated the audiophile market with the M50x and it was well seen with some amazing sales figure. This time though, they have stepped the game with the M70x. We tested these extensively and here\'s our take. Verdict: If you're serious about your production work, you probably should have at least one pair of premium headphones in your studio. They're extremely helpful both when mixing and tracking, and the more accurate their reproduction, the more useful they'll be. Verdict: It is for these reasons that we've been looking forward to reviewing the Rs. 22,999 Audio Technica ATH-M70x. The Japanese headphone manufacturer's 'M' series of studio monitors has been targeted at professional users, although a lot of personal audio users have also been opting for these models. Verdict: The Audio-Technica ATH-M70x are excellent headphones and a no brainer for pros and serious enthusiasts, but the price may be too much for casual music lovers. Good sound. Poor build. Not happy with the repair. Verdict: I've had these for a little over a year. Sound is moderately flat and accurate. Highs can be fatiguing but it depends on how hard you drive them.These are definitely good for music enjoyment and pretty great for mixing/video post production. To the point of me relying on them heavily. buy only if u'r not a bass-head. Verdict: I'm writing this review while listening to this headphone.used it for like 4 days and I can say that it is one of the best headphones because it really produces very flat and true music. and u can use it for hours without getting annoyed. OMG, these are very very impressive. Verdict: Opening them you will be impressed by their build quality and looks, I was. First listen, these blew me away. Bass that went low but didn't boom, treble that shone and sung but didn't grate. Well impressed. My Sennheiser momentum 2.0's are now relegated just to aircraft duty. Verdict: so I was looking for a sealed unit to use in noisy rooms and on flights, realize that these are not specifically built for air-travel. I listen to a mix of classical, rock, metal, world (Kodo, Tuvan, etc) and was looking for a good unit. I have used this for a couple of weeks now. Verdict: The sound quality of these headphones is stellar; I'll say that right up front. I don't know about "Coolness Factor", as no one's ever going to look at them except me. The one thing I find off-putting, though, is the cord. These headphones come with 3 cords, and that's just fine. Verdict: I cannot describe these headphones other than revealing. They are not bass or midrange heavy. So, why buy these headphones if ($) Panasonic RP-HTF600-S headphones have more bass and mids DETAILS. Verdict: So this is my review of the Audio Technica ATH-M70x I have had these for a week now so I have started to get a feel for them after using them for about 8hours each day. Verdict: Compare to my other headphones, the AKG ATH-M70X is by far my favorite. I use it almost the entire day at work and it doesn't hurt my ears at the end of the day, Love the size and shape of the ear pads too, they are very comfortable and the sound is almost as natural. Verdict: It's not until recently that I care about the quality of the sound I listen to: first got to FLAC from MP3, then learned equalizing, and now wanted something to get the best sound from my Samsung Galaxy S3 smartphone plus Boeffla Kernel (don't be fooled, killer mix for high impedance headphones). Verdict: great design with nice storage case.love the quality of sound produced.